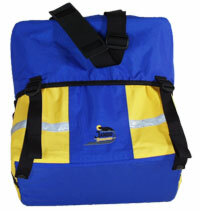 Description: The optional pannier pocket for the Hurricane series fits both the Frederick and the Hugo. 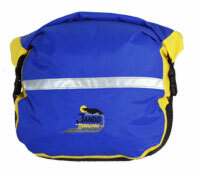 The bag is symmetrical and can be fitted to either the right or left pannier. Description: The Camille shares the same dimensions as its popular counterpart however is constructed of a Dupont Cordura® Outer & a 200 Nylon Inner with a one once urethane laminate rendering it waterproof. Description: Rain always a problem? Not with the Frederick. 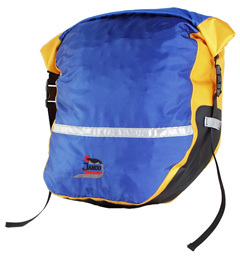 Its simple design and an easy-locking system make it the best product available in its class. Mounting the pannier to the bike is made quick and simple with the use of the Module-Loc® system. 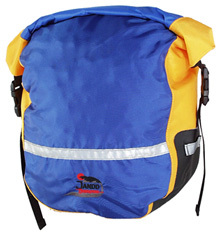 Description: The Hugo is a waterproof and voluminous monster of a pack. Made in the Jandd tradition of bigger is better. Mounting the pannier to the bike is made quick and simple with the use of the Module-Loc® system. Description: Perfect for the commuter or bicycle tourist who likes the rain. 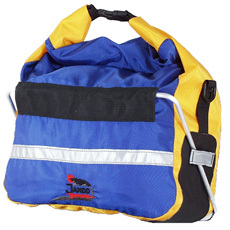 This bag has an exoskeleton suspension that holds it firmly to the handlebars. Click picture for more information.